New evidence involving the ancient poop of some of the huge and astonishing creatures that once roamed Australia indicates the primary cause of their extinction around 45,000 years ago was likely a result of humans, not climate change. Led by Monash University in Victoria, Australia and the University of Colorado Boulder, the team used information from a sediment core drilled in the Indian Ocean off the coast of southwest Australia to help reconstruct past climate and ecosystems on the continent. The core contains chronological layers of material blown and washed into the ocean, including dust, pollen, ash and spores from a fungus called Sporormiella that thrived on the dung of plant-eating mammals, said CU Boulder Professor Gifford Miller. Miller, who participated in the study led by Sander van der Kaars of Monash University, said the sediment core allowed scientists to look back in time, in this case more than 150,000 years, spanning Earth's last full glacial cycle. Fungal spores from plant-eating mammal dung were abundant in the sediment core layers from 150,000 years ago to about 45,000 years ago, when they went into a nosedive, said Miller, a professor in the Department of Geological Sciences. "The abundance of these spores is good evidence for a lot of large mammals on the southwestern Australian landscape up until about 45,000 years ago," he said. "Then, in a window of time lasting just a few thousand years, the megafauna population collapsed." A paper on the subject was published online Jan. 20 in Nature Communications. The Australian collection of megafauna some 50,000 years ago included 1,000-pound kangaroos, 2-ton wombats, 25-foot-long lizards, 400-pound flightless birds, 300-pound marsupial lions and Volkswagen-sized tortoises. More than 85 percent of Australia's mammals, birds and reptiles weighing over 100 pounds went extinct shortly after the arrival of the first humans, said Miller. The ocean sediment core showed the southwest is one of the few regions on the Australian continent that had dense forests both 45,000 years ago and today, making it a hotbed for biodiversity, said Miller, also associate director of CU Boulder's Institute of Arctic and Alpine Research. "It's a region with some of the earliest evidence of humans on the continent, and where we would expect a lot of animals to have lived," Miller said. "Because of the density of trees and shrubs, it could have been one of their last holdouts some 45,000 years ago. There is no evidence of significant climate change during the time of the megafauna extinction." 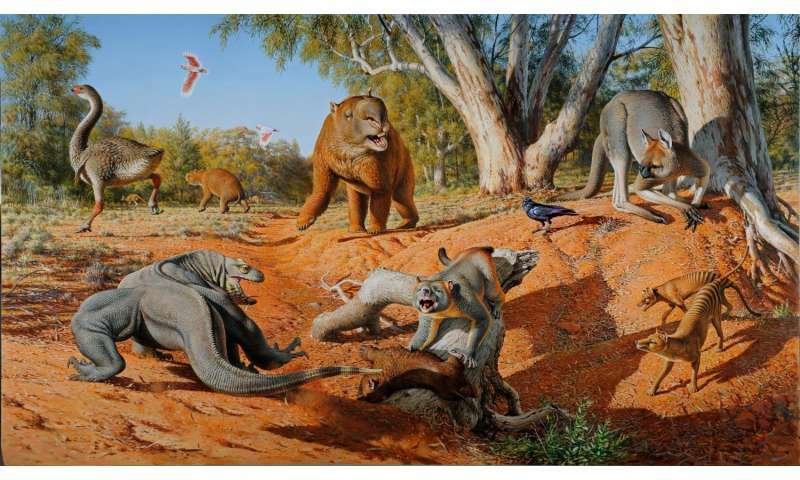 Scientists have been debating the causes of the Australian megafauna extinctions for decades. Some claim the animals could not have survived changes in climate, including a shift some 70,000 years ago when much of the southwestern Australia landscape went from a wooded eucalyptus tree environment to an arid, sparsely vegetated landscape. Others have suggested the animals were hunted to extinction by Australia's earliest immigrants who had colonized most of the continent by 50,000 years ago, or a combination of overhunting and climate change, said Miller. Miller said the extinction may have been caused by "imperceptible overkill." A 2006 study by Australian researchers indicates that even low-intensity hunting of Australian megafauna - like the killing of one juvenile mammal per person per decade - could have resulted in the extinction of a species in just a few hundred years. "The results of this study are of significant interest across the archaeological and Earth science communities and to the general public who remain fascinated by the menagerie of now extinct giant animals that roamed the planet - and the cause of their extinction - as our own species began its persistent colonization of Earth," said van der Kaars. In 2016 Miller used burned eggshells of the 400-pound bird, Genyornis, as the first direct evidence that humans actually preyed on the Australian megafauna. The new study also included Research Professor Scott Lehman of INSTAAR. The study was funded in part by the U.S. National Science Foundation and the German Research Foundation. We will continue to kill for kicks until we have killed all the life which supports ours. The spoiled Trump kids just shot an endangered Cheetah, for "sport:". I guess the Cheetah was unarmed, or they would not have tried it. 1- what is your point? 2- can you verify where these "peppered" animals died from a bombardment? 3- if they're peppered on "one side" only it is just as likely that they were buried or partially exposed when "peppered" than "killed by the peppering"
if you're versed in the scientific method then why refuse to actually present reputable evidence when making a claim? Google Scholar says "About 16,700 results (0.07 sec)"
Aboriginal fire stick farming wiped out Australian megafauna, surprise? Yeah, but we caused AGW. Isn't it time you realized we live at the great expense of every other living thing? He works straight from the denier playbook: don't like the science evidence? Attack the scientists. And the future. The conservative mantra of getting rid of any "inconvenient" regulations which inhibit jobs (translation: profits) is disturbing. Comrade Trump is making this an early priority. (Make externalized costs great again! ) Let future generations deal with the consequences which include loss of biodiversity and our coastal cities. And the evidence for this assertion is... where, exactly? No mention of fire stick farming in the article. Cite your sources, please. I somewhat doubt that spear wielding humans who lived some 45,000 years ago in Australia, would have "killed for kicks". They killed in order to eat, just as animals kill each other for the same reason. Being clever as they were, they probably upset the balance of nature and inadvertently brought about extinctions, but... In the course of the history of the planet there have been massive extinctions that dwarf anything man has been able to do, which happened from totally natural causes. So yes... I agree with you that hunting for sport is murder, but hunting in order to eat is perfectly natural. where is your study and where is the validation from secondary parties? well, then it seems to me that you should be able to provide the studies and evidence supporting it, eh? They killed in order to eat, just as animals kill each other for the same reason. Being clever as they were, they probably upset the balance of nature and inadvertently brought about extinctions, but... In the course of the history of the planet there have been massive extinctions that dwarf anything man has been able to do, which happened from totally natural causes. They probably hunted them for survival and protection as well. Dead threats no longer threatens. And well, there were areas to conquer as well. Lex, the moderator position here must be an unpaid auditing spot for kids finding out what work looks like. They try, but are all over the place, trying to understand what is going on. For some reason, they allow the snipers here to conduct their character assassinations. That I do not understand.